Make room for Me…. For Love, throughout your day. & blesses all beings I send your way. Like the highest string of a fine violin, your love will move others to reach for our melody. 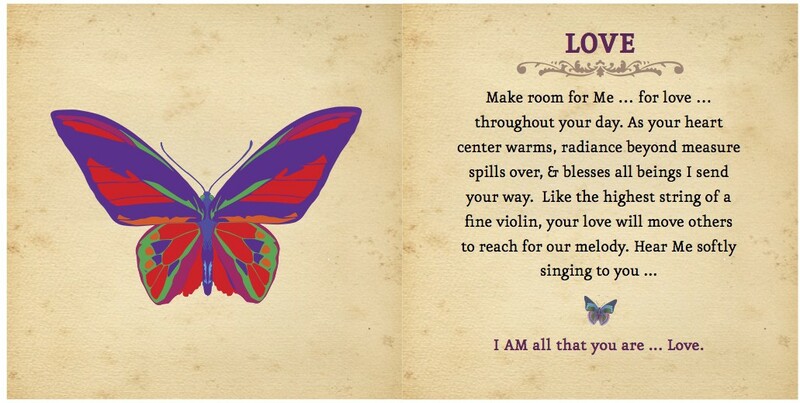 Hear me softly singing to you…..
IAM all that your are….. LOVE. Is there any subject that has been written more about than love? There are love poems, love songs & love letters. Epic novels of sweeping love stories or photo journals of our love for animals and nature. This story is about a Valentine that resurfaced the day before my beloved’s funeral. A story of love that binds two souls: One living & the other, only days before, killed in an accident. This entry was posted in Emerging Soul Cards and tagged grieving a lost love, Love, Transcendence, Valentines Day Story on March 4, 2015 by Rebecca Winters Rodriguez.